This, our most affordable and largest selling set, features all the charms of the Deluxe Single Box on a slightly smaller scale. The lid of the chest is adorned with the silhouette of the Magi following the Christmas star. 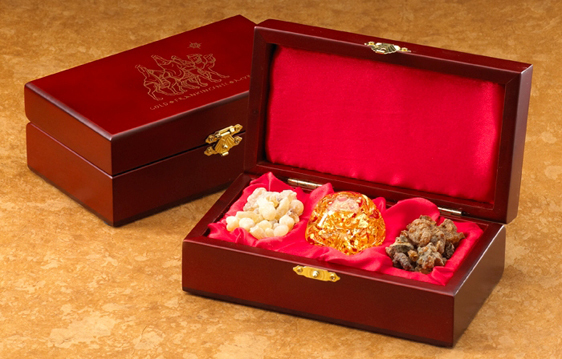 The solid wood box holds real, 23k gold in an orb-shaped glass bottle and authentic frankincense and myrrh. The set is both beautiful and attractively priced. The satin lined box measures 6 3/4 X 3 3/4 x 2 . The set is beautifully packed in its own, gift box covered in a brightly colored sleeve that shows and fully explains the set – making it easy to sell off the shelf. Give the most unique and perfect gift! This gorgeous 3 Kings Gift set is our most affordable and largest seller. The lid of the chest is adorned with the silhouette of the Magi following the Christmas star. The solid wood box holds real, 23k gold in an orb-shaped glass bottle and authentic frankincense and myrrh. The set is both beautiful and attractively priced. The satin lined box measures 6 3/4 X 3 3/4 x 2 . The set is beautifully packed in its own, gift box covered in a brightly colored sleeve that shows and fully explains the set.